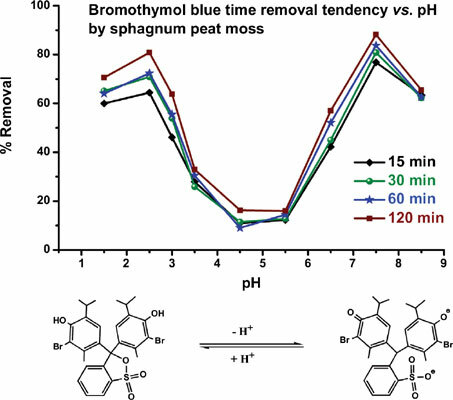 A green and environmental–friendly method for the removal of the hazardous bromothymol blue from aqueous solution was considered applying a hydrophilic, biocompatible and biodegradable natural sorbent of Latvian sphagnum peat moss, applying shaking-dispersive solid-phase extraction. First, the influence of shaking speed was evaluated at 300, 600, 900 U. Furthermore, the optimum conditions of dye-adsorption, such as pH, adsorption-equilibrium contact time, adsorbent mass, and adsorbate initial concentration were investigated. In addition, the adsorption equilibrium isotherms, thermodynamics, and kinetics were studied. Thus, the optimum removal of bromothymol blue was concluded at a shaking speed of 600 U. Regarding the dye adsorption at different pH, bromothymol blue showed two removal maxima at acidic (pH 2.5) and almost neutral (pH 7.5) media, reaching dye % removal of 80.8 and 88.2 %, respectively, in 120 min of adsorption equilibrium contact time. Moreover, the dye removal improved reasonably by increasing the concentration and the sphagnum dose. Additionally, the equilibrium isotherm plot correlated comparably to Langmuir's and Freundlich's models. Also, the adsorption kinetic study demonstrated a better correlation to pseudo-secondorder plot than to pseudo-first-order one. Finally, excellent reproducibility in % removal was demonstrated with RSD values of 2.2 and 2.7% at pH of 7.5 and 2.5, respectively. Acidic dye removal, bromothymol blue, latvian sphagnum peat moss, adsorption equilibrium time and capacity, kinetics, adsorption isotherms.